Welcome to “Women Around the World: This Week,” a series that highlights noteworthy news related to women and U.S. foreign policy. This week’s post, covering March 23 to March 30, was compiled with support from Anne Connell and Rebecca Hughes. 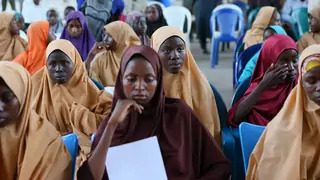 Last month, Boko Haram released dozens of Nigerian girls held captive since February, when militants from the group descended upon the northern Nigerian community Dapchi and abducted 110 students from their dormitories at the Government Girls Science and Technical School. A report by Amnesty International indicates that Nigerian security officials were warned of the approaching militants, but failed to stop the abduction or rescue the girls. The abduction follows a similar attack in 2014, in which 276 girls were held captive, and calls into question the Nigerian government’s commitment to ensuring protection of civilians. Last week, India’s Supreme Court ruled that punitive action should be taken against village councils— or khap panchayats—that impose punishments on those who marry outside of their faith or caste, including social boycotts, threats of violence, and so-called “honor killings.” Since 2014, nearly 500 people—primarily women—have been murdered under the guise of protecting the community’s “honor.” In addition to urging the government to pass "preventive, remedial, and punitive" measures, the court also recommended that communities establish safe houses for couples and film all khap panchayat meetings.